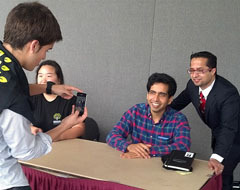 Khan Academy founder Sal Khan ’98, MEng ’98 told an MIT audience May 8 about one secret to his success: he created his early videos for one person, his cousin in Louisiana. That human touch has made all the difference, he says. “If I were making these for Bill Gates, I would have messed up,” by making the videos seem polished but not personal. Instead, he says, Khan Academy’s 4,100 free online videos are “very conversational and focused on intuition.” Watch the one-hour interview with MIT President L. Rafael Reif, with an introduction from a 60 Minutes segment.